I woke up this morning to find a notification from Facebook reminding me what I shared on this day in some previous year on this blue world. When I went to check those memories, I found what I expected in the beginning (friends I made that day), but after scrolling down a bit, I saw a post that caused me a severe headache: it was one of the worst memories in my life, that odious day full of death and blood. When I saw the pictures, for a moment, I relived those moments again with the same amount of dread and sorrow, the feeling of inability, grief, woe, and suffocation. I remembered how I cried like a baby amid the hell of that day. On 16 August 2015, I woke up to the sound of an airstrike near my house. I got up immediately, unaware of what happened. I put on my sandals and picked up my bag which I put my camera in, and got out of the house. I followed the sound of ambulances to guide me towards the targeted place. While I was walking through the street, the warplane came back to implement another airstrike. I did not know what I should do; the feeling of fear and confusion integrally possessed me. People around me were rushing to the entrances of buildings to protect themselves from the inevitable airstrike. I could not do anything, I just got down on the ground. It was a few seconds before I heard the series of four explosions. It was relatively far from me, but my feet did not help me stand up again due to fright. After a short while, when the sound of the warplane vanished, I went quickly to the targeted place. I followed the emitted smoke and the sound of ambulances until I arrived. It was the main market in my city. People were in a state of panic and fear, not knowing what they should do amid the fire and destruction. Victims everywhere—I could not take out my camera then because I had to help with rescuing the injured. Victims’ bodies were everywhere. A few minutes later, rescue workers arrived. I got out my camera to document the catastrophe that had taken place. My fingers were shaking as I pressed the shutter. My heart was pulsing extremely fast from the horror scenes I was witnessing, and from the fear that the warplane could come back at any moment to target the same place. Amid those confounded crowds, all you could hear was the screams of wounded people and rescuers, everything was screaming, the atmosphere was extremely uproarious. Nothing broke that uproar except a stronger one when the warplane came back again. People started running towards nearby buildings due to their massive fear; they dropped the wounded people they were helping in order to survive themselves, not conscious of what they are doing and what is happening around them due to the enormity of the situation. The wounded stayed on the ground, their wounds tormenting them, awaiting the death that is coming towards them again, the same death that failed to take their lives the first time, waiting for their death amid unlimited grief and impotence. After a few seconds, once the sound of that scary ghost was gone again, people came back hastily to complete their work. 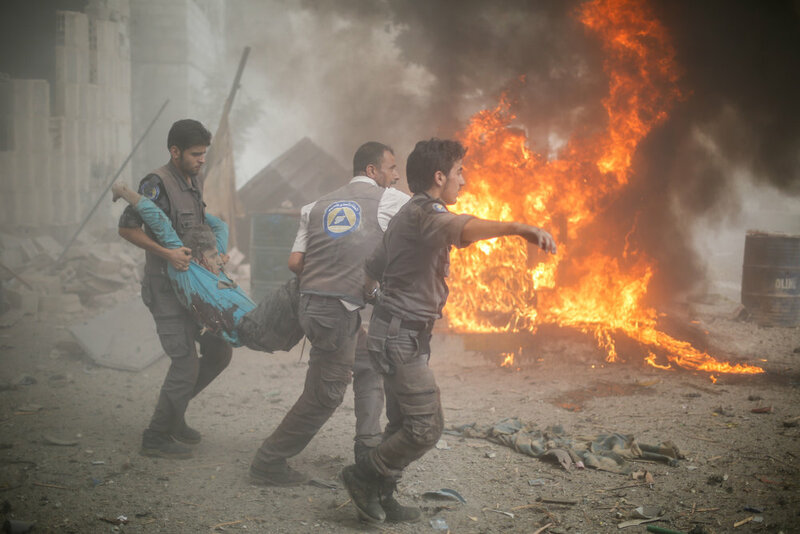 They started rescuing the injured, moving the corpses, extinguishing the fire, and removing the rubble from the street to provide a space for ambulances to pass. I was lost amid that catastrophe, had no idea what I should do, I tried to keep documenting the calamity. There was a man who had lost his stall, I was watching him through my camera’s viewfinder, I took a picture of him in a moment that I could not understand then in all its details, but I realized the size of pain when I saw this picture later. This small stall was all that he had; his friend was trying to calm him down, but his look towards his only source of sustenance summarizes the whole tale. I ran into one of my friends back at the deadly epicenter, who told me there were more than a hundred martyrs killed in these airstrikes! 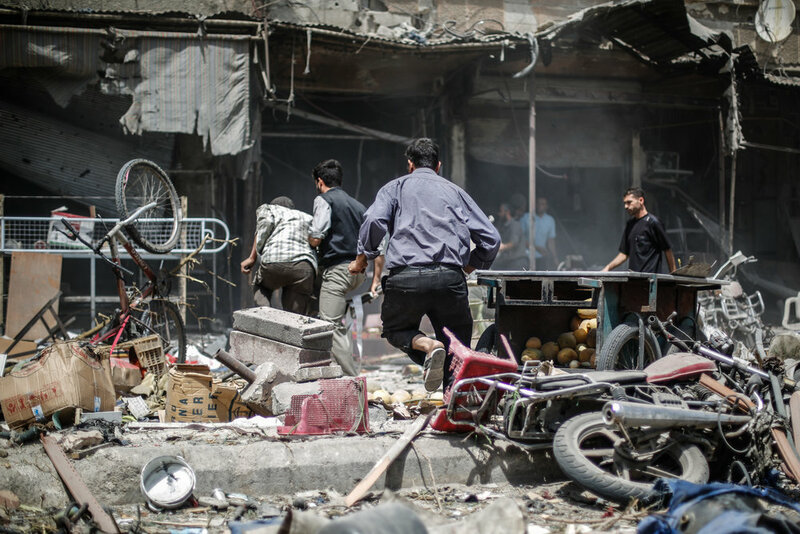 The airstrikes had targeted two central markets and many vital areas at the same time. I could not believe what I heard. 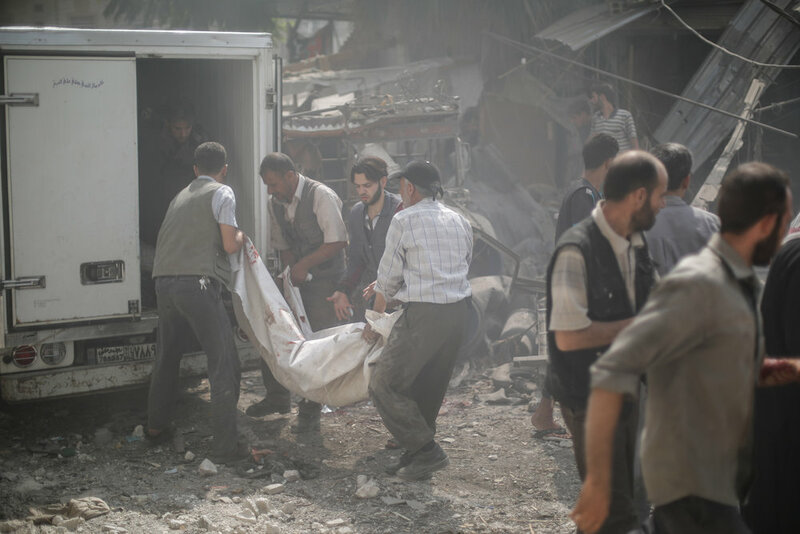 Immediately, I headed towards the Syrian Civil Defense center, which was called Point 200, and I saw a huge number of people gathered outside, the look of pain and grief clear on the face of all of them. I went to the gate and entered—I was shocked by that big catastrophe! For a moment, I could not understand what was going on. Dozens of scattered bodies everywhere, many of them children and youth. 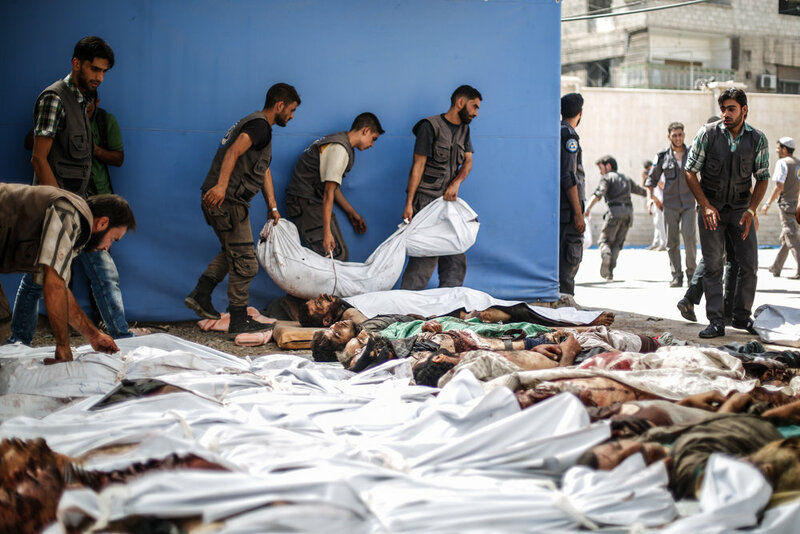 I realized that I should do something beneficial, the flow of corpses was not stopping, dozens of rescue youth were enshrouding the bodies, they were barely covering the intensity of death on that day. I picked up my camera to document those tragic moments, because that was all that I could do at such a time, it was very important to let the world see the disaster that is going on. Hopefully, they might do something to change that bitter reality. I started taking pictures. For a moment, I thought that seeing everything through my camera’s viewfinder might protect me from being traumatized—but in vain. I witnessed men mourning over the bodies of their sons, replaying the tape of their beautiful memories together. They talk to them, hoping to hear from them even just the sound of a single breath in return, they make an apology to them, blaming themselves for their death. 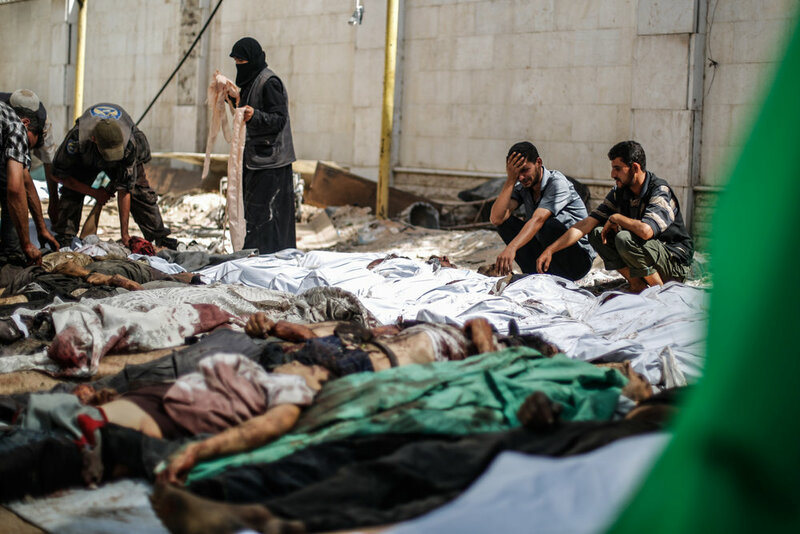 “Oh my son, get up … I swear, I will never send you to work again … for God’s sake, get up.” Devastated women trying to calm down their children in front of the bodies of their fathers and relatives. People with a look of fear and expectation on their faces as they try to identify their missing relatives among the accumulated corpses of victims. Everybody was devastated, collapsed, no one fully conscious of what is happening, no one can conceive of what guilt those innocent children were killed for. Everything was ambiguous, unclear, random as the randomness of killing, blood, and death in the middle of that hell. The only thing that broke the uproar of those moments was the return once again of the death ghost. With each airstrike and seeing those terrifying scenes, the fear of that damned plane becomes bigger and bigger. Everyone was confused, there were no entrances to take shelter in. I sat down next to an ambulance, which, practically, is not useful at all. It was just a fraction of a second before I heard the sound of explosions. I rushed into the ambulance with the rescue workers, and we went hastily towards the targeted place. The airstrike had been right next to us, it was less than one kilometer that had separated us from inevitable death. Although the distance was short, I felt like our journey in the ambulance extended for years. I was counting the seconds, calculating the breaths, listening carefully to the tumult around me, afraid of hearing the sound of that scary monster again, I was trying to prevent myself from imagining what could happen to us in case the warplane came back to implement a double airstrike at the same place. We arrived in the place, the rescue teams started spreading out, I carried my camera amid the fright that did not leave me on that day even for a moment. The first picture that I took was of a member of the Civil Defense as he entered the area; immediately I entered after him. The scenes were extremely terrible, fragments of humans everywhere, screams crack the head at those harsh moments. The smell of smoke in the aftermath of an airstrike is unforgettable, it is a smoke mixed with blood and gunpowder. 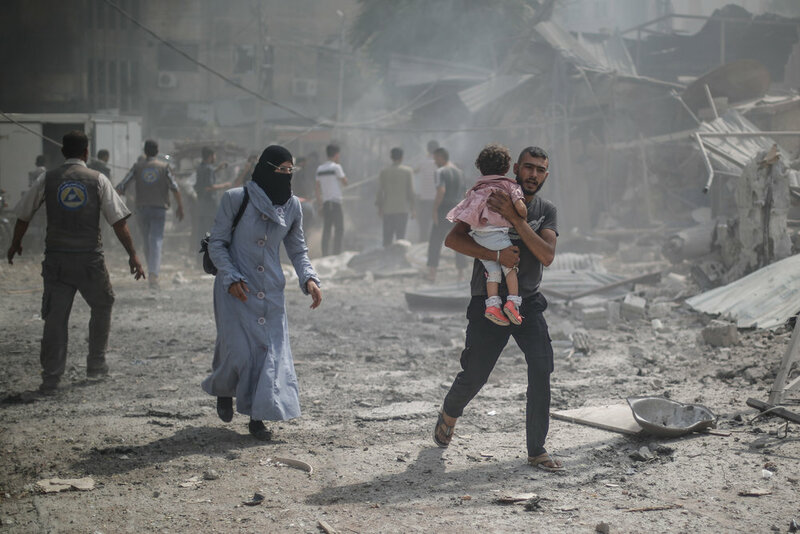 I saw a father carrying his little girl among the crowds—fortunately, she was not injured, but the looks of fear on his and his child’s faces were enough to tell the story of fatherhood under the war. The flow of injured was not stopping; everywhere you looked, you could see a group of people carrying a wounded person. Some of the wounded people had lost limbs, some of them were lucky enough to stay in a full body. Rescue teams adopted a triage strategy in order to save people who can be treated first due to the huge number of casualties. People were transporting the victims by any available means; they were even using motorcycles to do so due to the lack of ability to transport everyone by larger vehicles. There was a small shop that sold gas containers, it was burning, crowds of people were trying to extinguish this fire because there was a man stuck in there. It was impossible for the fire trucks to come right away on that catastrophic day, this was one of the most difficult moments, people were extinguishing the fire with very basic methods until a fire truck arrived. Unfortunately, the man was not lucky enough to stay alive, he had already died, not because of the fire, but shrapnel had permeated his head. Staying there for a long time was not safe at all, because of the potentiality of the warplane’s return. I spent a total of exactly ten minutes there; I felt during these minutes a severe exhaustion, I felt the heaviness of my body, the difficulty of breathing, the inability to think of anything. I went back to Point 200, which was the place where they were bringing corpses to be shrouded and documented to be ready for burying later. When I arrived, the number of casualties had massively increased. I tried to take some pictures but I was not able to continue. I went with my friend to the top of the building, I thought staying away from the bodies could give me some strength to be able to take some pictures, but what happened was the contrary. When I saw the huge number of victims from above, when I saw the fathers crying over their sons, the crowds of grieving people outside, I tried to pretend to be a bit stronger and keep documenting these tragic moments, I took a few pictures, but I was barely able to catch my breath. My friend started to cry, I tried to calm him down, but I could not possess myself, because I was collapsed too, and I started crying. Yes, I cried, cried like a baby. The tape of memories of that day flashed quickly through my mind, which made me unable to even stand on my feet. We headed towards the stairs, helping each other to go down. I was not able to feel anything; my legs, hands, ears. My whole body became anesthetic due to the trauma; I went back home after that and to this day I do not remember how I got there. Now, I go back to review my French lessons, to continue my new life, which is supposed to be “normal” in Paris, after I have recalled this painful memory, the memory that I thought I had succeeded in erasing completely, but it seems like it is impossible to forget such memories, because it is not just a story, but these events carry within them all the feelings I had lived, in all their details.